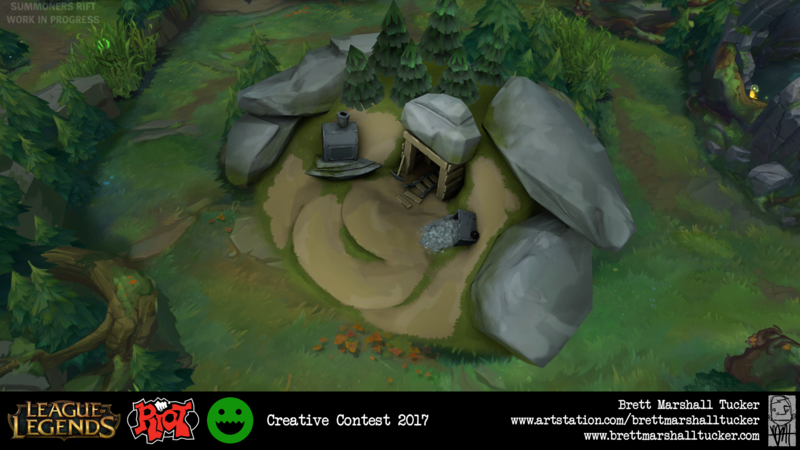 First time taking part in a contest on here. I have only played LoL a handful of times but the art style is one I've always admired. 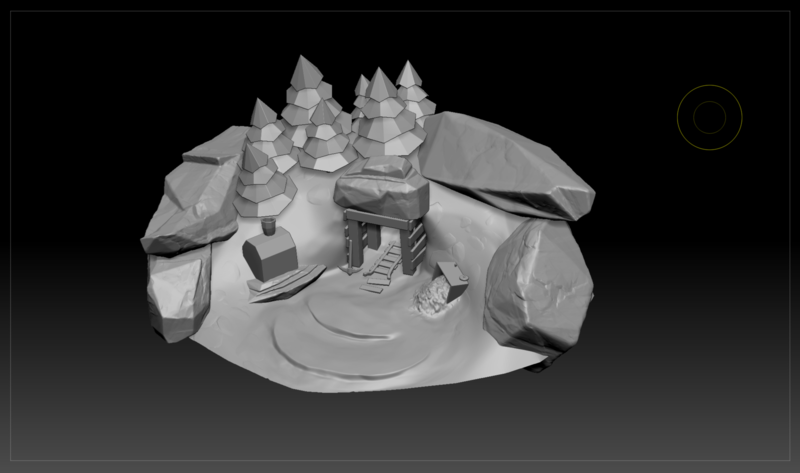 I also haven't done much low poly, stylized work so I am excited to try my hand at it. Not sure yet which if I will do an inhibitor or a turret but I do know that I want to utilize my roots, aesthetically. I'm from Appalachia, so a makeshit, janky design should be fun to recreate with these assets. Imagine what you'd fine around the property of someone who has lived alone in the woods for a long time; think of the things this person would craft out of found materials to protect themselves. 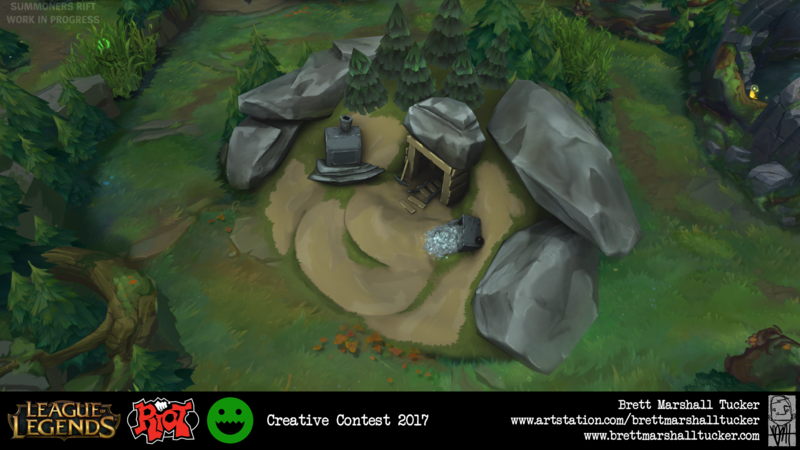 I'm thinking either an inhibitor utilizing an old ground well or a turret made from knotty boards and rusty nails - maybe a barrel or a pile of bricks for the base. The creep den will exist either in a cave or at the base of a pine. Also entertaining the idea of a boulder with a tree growing on top of it as the canopy of the den. Either way, you can expect an arrangement of broken crates or barrels covering the entrance to their lair. 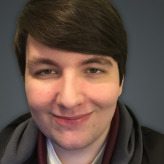 I look forward to seeing what everyone makes and what I can pull off myself. Still yet to do any concept paintings but I got a quick 3D sketch in addition to subway drawings done today at work. For the turret, I am leaning towards a rudimentarily constructed scaffolding, made from white birch branches and old boards. I'd like to make it more of a scrapyard aesthetic so I'll probably try to work in things like corrugated steel, rebar, road signs or maybe an outhouse door or a car door. Could be fun. The inhibitor is more straight forward and the only idea that comes to mind is the use of an old well. Not too sure about that. In the 3D sketch of the turret, I have a sort of mystical arrangement of rocks around a puddle. I definitely want the rocks or at least some concentric marking on the ground around it, to tell a story of how someone enchanted this structure to protect them and make the crystal float above it. The big stones on the outside don't make much sense, due to the idea of champions tripping over them but I am also trying to work in a boobytrap mentality so who knows. As for the creep den, I'm still brainstorming but I like the idea of a collapsed wooden shack or a wooden scaffold around the entrance to a mine, maybe with a pickaxe and a lantern sitting out in front of it. Time will tell. Critique is crucial - help me out if you have comments! 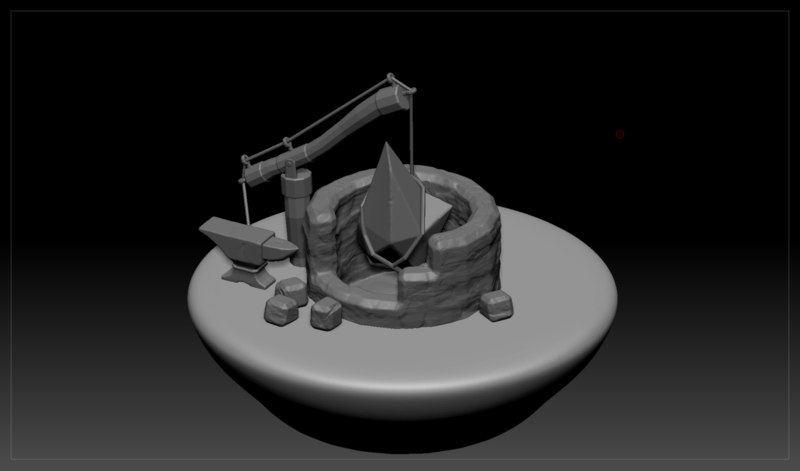 I like the progress so far You have some cool design ideas, going with an enchanted structure that was built out of whatever was available is a cool concept! The stones around are definitely a plus, but I agree that they will interfere with game play. Maybe going for details directly carved in the ground texture instead? Oh, and here's my mood board (in progress) for the project. Thanks for the feedback, RobertTerritory! Right now, this is really just a sketch but those are important details to keep in mind so thanks for the heads up. 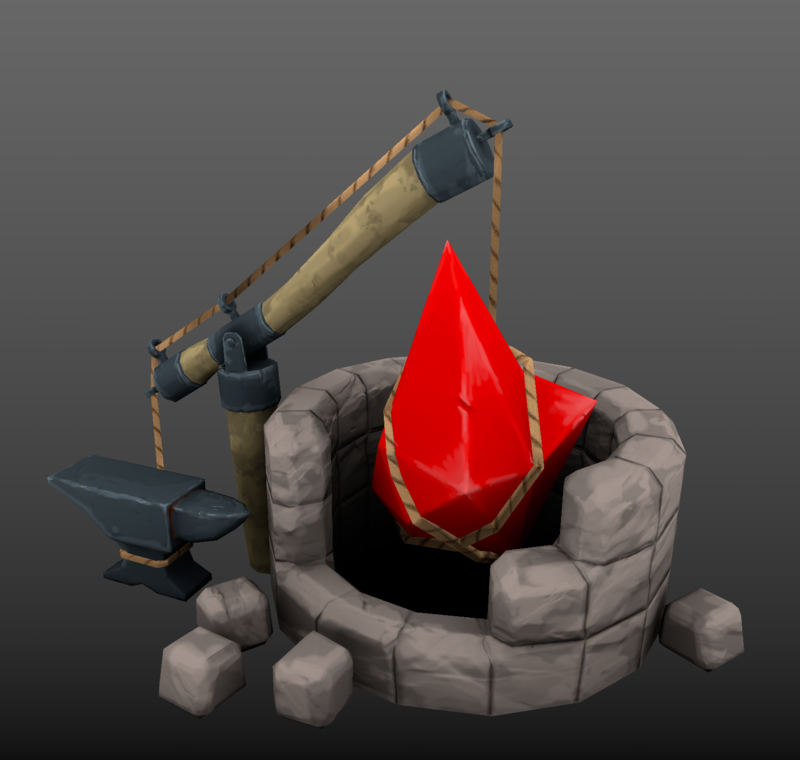 As for the stones, maybe actual stones around the base and then a drawing near the bottom or something like that would be best. They were mostly used to jazz up the concept a bit but I think they could work from a narrative perspective. Hopefully I'll have more sketches up soon! Here's a quick attempt at a hand painted grassy texture. New to the hand painted look so I'd like to show this process as it develops. 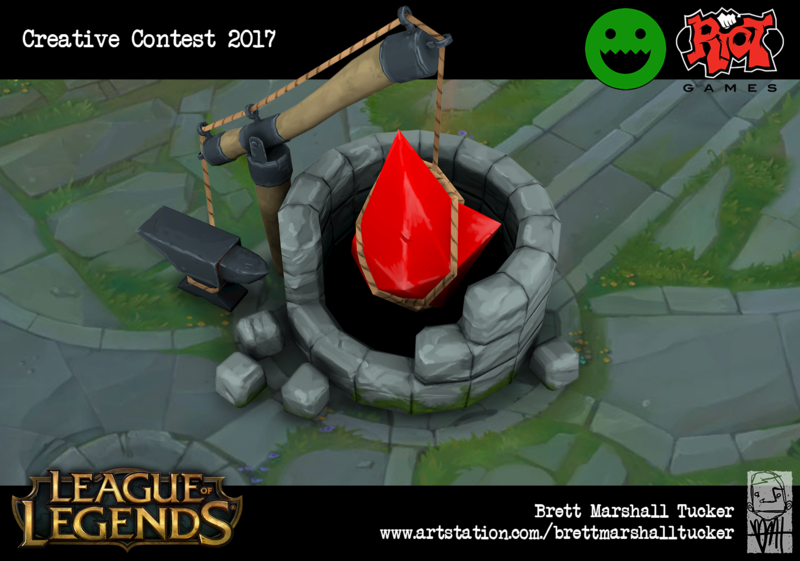 The next one will have more of the rocky dirt that is common on Summoner's Rift. Really like these ideas. The scrapyard idea sounds like a cool concept. Almost like an early construction version of the rift. Thanks! Hopefully I can make a lot more headway today. Finally back at it! Bought a new computer recently so I had to do some serious file migration after building the damn thing. 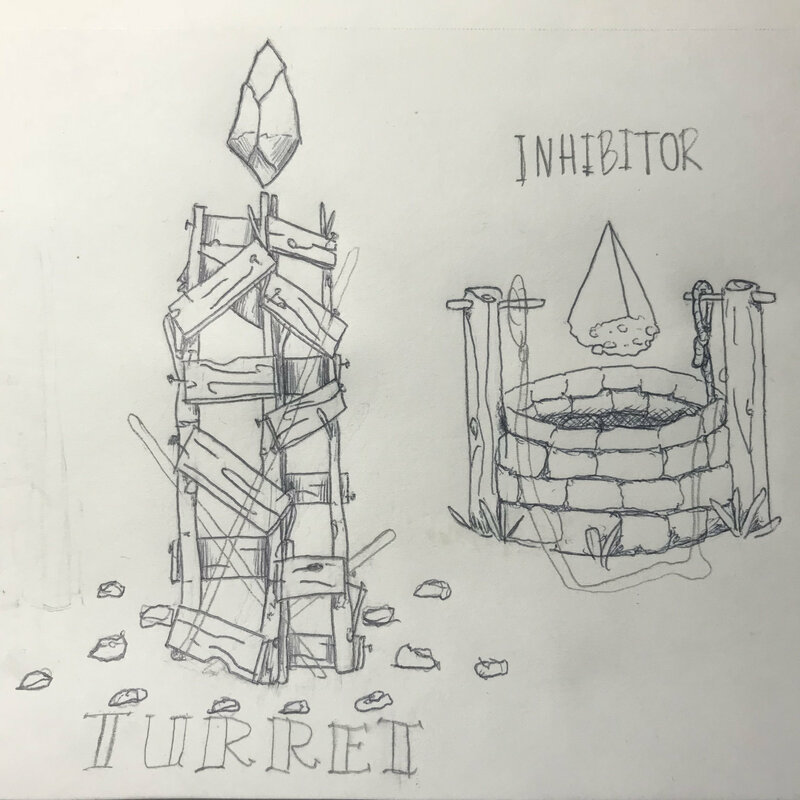 Anyway, here's a couple of ideas for the turret. I want it to have a rushed/handmade/hobbled look but I am unsure about the components on the right. I think that the runes in the ground make more sense than the rocks on the left and the antlers holding up the crystal might be more appropriate than it floating. Any input is greatly appreciated! 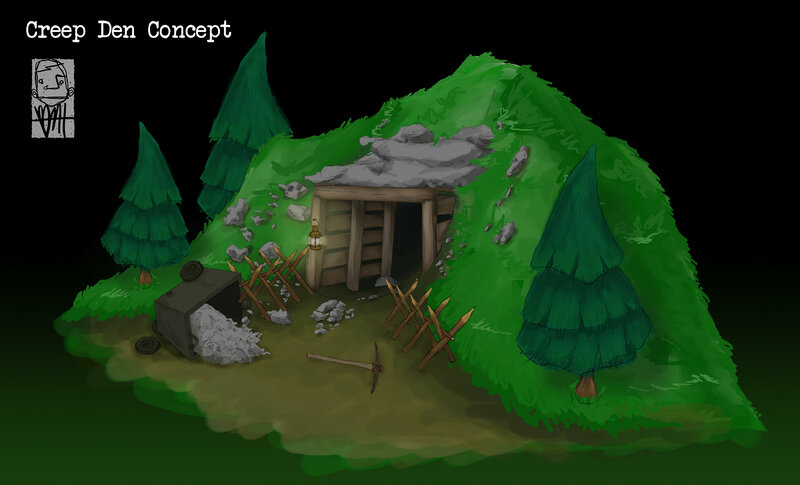 Creep den concepts will be up soon. I thought that too, as it instantly dates in and puts it in our world. Happens with the corrugated steel too. I'm trying to think of other materials that would work. Maybe more tools or just some metal plates. I am so rusty with Photoshop but here's the idea for the creep den. Not the correct perspective overall, I know. I'm imagining an old mine shaft that the person who made the tower found and befriended the minions inside. Not too sure about the barricades but they help tie in the aesthetic of the tower with that human touch. 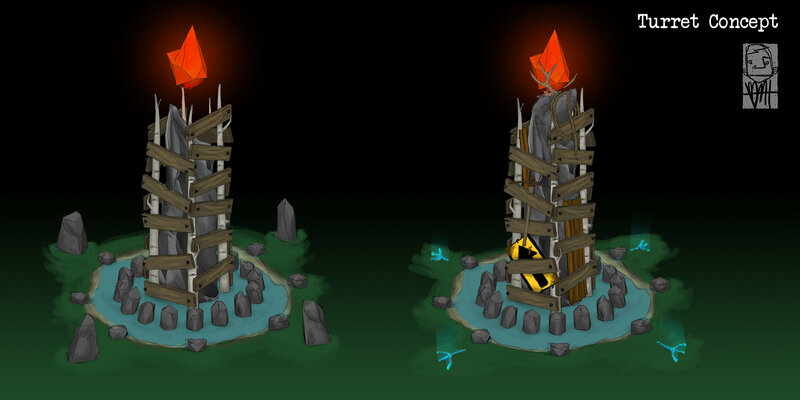 It could have some runes in the ground in front of it, like one of my tower concepts, or maybe a blue glow emanating from the mine shaft itself. Nice concept idea! I think you could pull off some really neat story telling aspects. The closest thing to a mine I can think of is the shopkeeper in the howling abyss map, but without all the snow. Maybe you can pull some ideas or inspiration from these and transform it into the style you're going for. Keep up the good work! Thanks for the reference! It's definitely really helpful to see the assets in that trailer. Gives me a lot more ideas of the kind of content I can include. I appreciate it! Been a minute since my last update. I built a new computer and took some time off for the holidays. 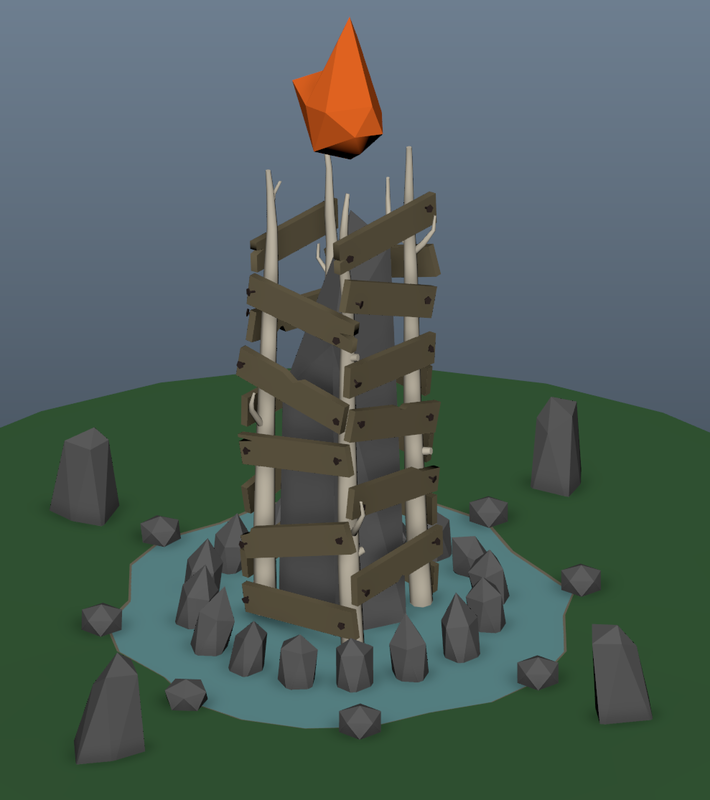 I decided to scrap the tower and go back to my original idea for an inhibitor based on an old ground well. Here's the 3D sketch I did. Hoping to finalize some things and go for the actual sculpt. Small things need decided, like if the anvil should be on its side, if the rubble at the bottom is enough and how the perspective should be. I'm pretty set on the well and sweep. Too late to change at this point, anyway! I'm excited to texture this one. Updated to the creep den to follow. Starting to figure out the creep den. Gonna reference Dominion a little more with the smelting furnace. This will also tie the creep den and inhibitor together thematically. Advice and critique is always appreciated! On to the inhibitor! I hope to be texturing by tomorrow evening. Cutting it close on time so not much time is being spent on the high poly sculpts. Just need some reference texture to help with the hand painting so now onto making the cavity maps and unwrapping! Resculpted the inhibitor and moved on to the hand painting. I've never done this before so it's been a really fun process. Thankfully, I've been a painter for a while so this is kinda coming naturally. 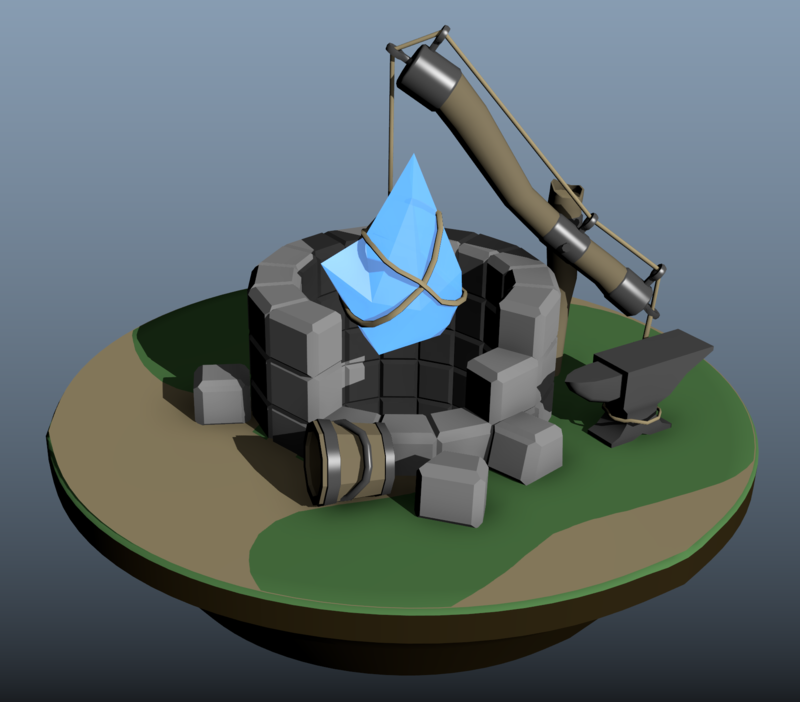 Here's about two hours' progress on the inhibitor. Looking forward to detailing the well more and then getting the contrast right as a whole. I think I'm calling it done on the inhibitor. My first time hand painting yielded acceptable results and time isn't allowing me to push it much further. Critique is welcome! Time is running out and I've been having some annoying hardware issues so I'm taking that as a sign. This contest was very informative for me. 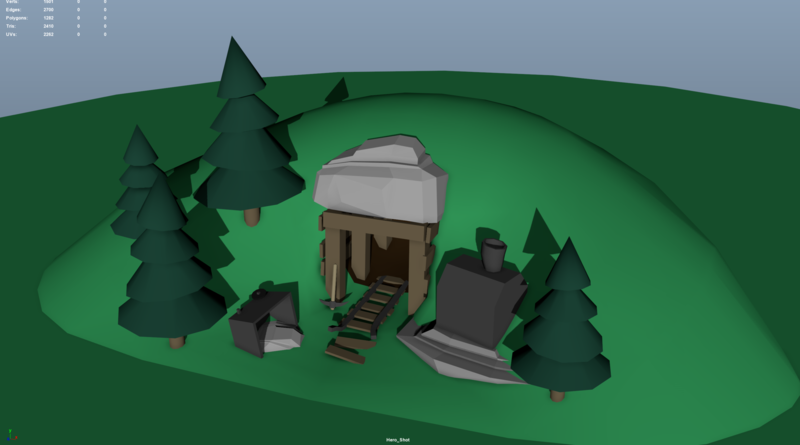 I've never hand painted before, never done scenes in such low poly and never used a high poly mesh solely as a source for an AO map. Keeping things to one diffuse sheet was really fun and challenging and I got to use Substance Painter in a way I never had before. Looking back on this process, I now know a few things: I need to get better at time management, I need to move on and assess details after everything is fleshed out and I need to reference source material more closely for style. I know my trees aren't great but I know this is because I spent such little time on them. The same can be said for my textures. I know what needs to be done to make them match LoL's style more and I would love to do that sometime. 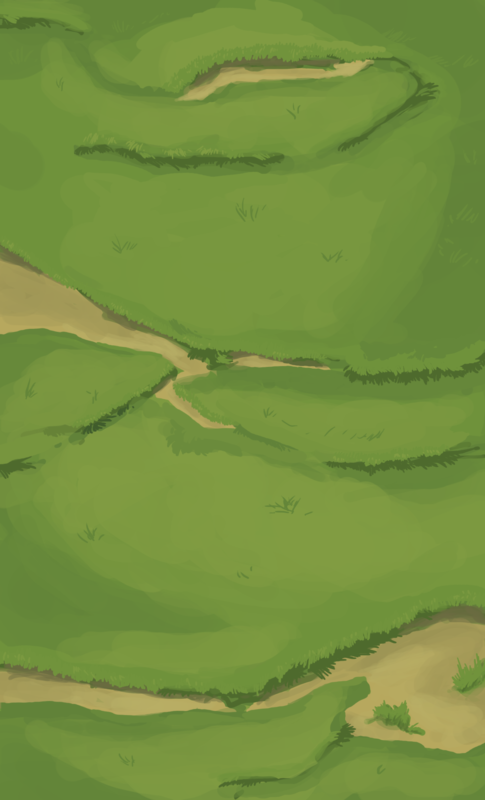 I made things too smooth looking in weird places and could have benefited more from loose, painterly brushstrokes. Still, I learned all of this and I now know what to do when attempting this style again. Great knowledge is borne from frustration and trial and error, and I have plenty of that during this challenge. PS: Here's the finished creep den. changes will not be made unless I can move things around last minute. I would love to do more but calling it done and moving on will be the best teacher. Finally submitted everything. I have plenty of criticisms of what my finished products were and I know exactly how I want to fix them once I get the chance and some distance between now and when I decide to come back to this. As I said before, I learned a lot from them and I came out with some decent portfolio pieces in a style I have never done before so I couldn't be happier about that. 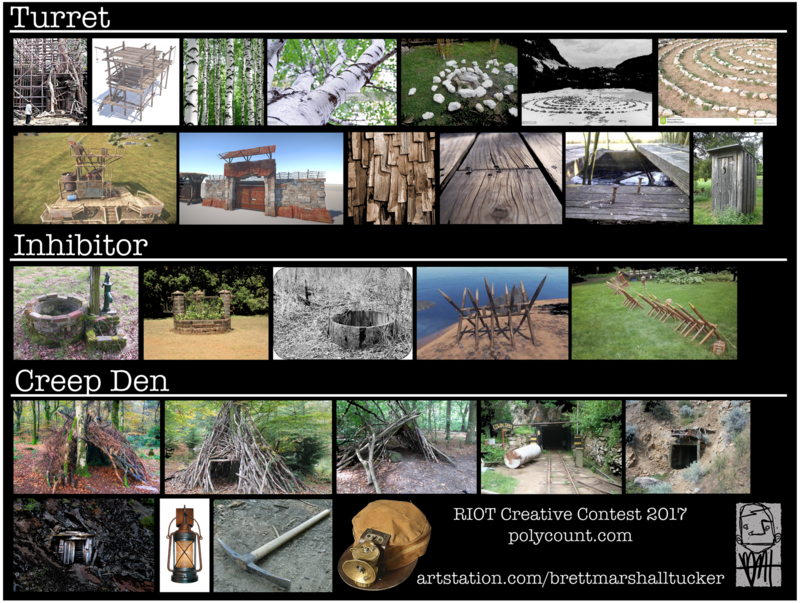 The breakdowns and beauty shots are available on my ArtStation account at www.artstation.com/brettmarshalltucker. Please go check them out and feel free to offer critique or criticism there or on here. And congratulations to everyone who finished on time and everyone who came out of this with something they're proud to show off. I learned so much just from viewing your threads and from everyone who commented on mine.